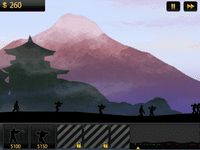 This side-scrolling real-time strategy game uses unusual silhouette graphics to depict a battle between two opposing sides. You choose which units to generate from your base, and send them across a 2D battlefield to your opponent's base. At the same time, your opponent is also outputting units. Over time, and as you defeat enemies, you earn more money to purchase more units, and as you defeat levels you also gain new types of units and new upgrades. This game used to be known as RTT - Modern Strike, but the developer (VOLV) revised the name recently.